This month, join us for a whistlestop tour around the country to meet some of these intrepid beer explorers. This month, we passed a landmark number of Beer52 members, so we thought it would be fitting to celebrate with a whistlestop tour around the country to meet some of these intrepid beer explorers. It was also, of course, a mighty fine excuse to swing by some of our favourite breweries, meet the brewers and grab some amazing beers for the Beer52 box. Thank you to everyone who came out to share a pint and a chin-wag; it was a genuine pleasure to meet all of you and to get your feedback on the club and on Ferment. We heard so many great ideas for future themes, several of which we hope to make happen in the coming months. To those who couldn’t make it along: see you next time! The first stop on our Beer52 Road Trip was a biggy... London, home to the awesome Mondo Brewing, tucked away on an unassuming side street, straddled between the lush greens of Battersea Park and the unapologetically unpolished Brixton. The brewery taproom has a compact, well thought- out, contemporary feel with homage being paid to its American founders’ roots in the form of a full-sized popcorn vending machine for punters to nibble on, along with their big and juicy US-inspired beers. Showcasing its full range of core and the latest experimental pilot batches – all served fresh, more or less straight from the tank, which sits only a few meters away – this is a perfect location to meet up for a beer with our loyal Beer52 members. To kick off the evening, the brewery kindly provided our members with a beer on the house, the most popular of which seemed to be the big, juicy murk that was Willow Wacks, a 6.4% New England IPA; a sign of the times, as this style is bang on trend and incredibly well represented by Mondo Brewing. Once everyone was settled in, it was time to say welcome and a huge thank you for turning out in such strong numbers on a Thursday evening . The evening was an opportunity to bring people together with good beer. It struck me that many of our members might only live a stone’s throw away from each other, yet have never spoken. But tonight we were all in the same room sharing a new experience together, making new friends. That’s what beer is all about! Feeling the good vibes, co-founders of Mondo Todd and Thomas treated us all to a flight of three beers, talking us through each and sharing the story behind them. To wrap up the evening in style, we head into the brewery for an in-depth tour, getting to understand the setup. Mondo’s attention to detail left us all really impressed and, for me, solidified its reputation as one of the best new breweries in London. *Mondo is celebrating its second birthday in style by launching a new DIPA. Drop by the Tap Room on 3 June, 2pm until late for more fun times and beer. The next stop on our grand Beer52 road trip was our closest to home; Glasgow’s East End, the home of Drygate. Known as an ‘experiential craft brewery’, the site lies in the shadow of the Tennent Caledonian Brewery, but offers a decidedly more esoteric range of beers than its neighbour. Housed in the seven-toothed roof of a former box factory (the pattern of which inspired the brewery’s logo), Drygate is one of the most popular taprooms in Glasgow. A stone’s throw from the city’s medieval cathedral and gothic metropolis, its location is smack bang in the historic heart of the city. Offering a beer hall, restaurant, events space, bottle shop and sun terrace, there’s plenty to explore and, on this uncharacteristically sunny Glaswegian day, the place is positively buzzing. 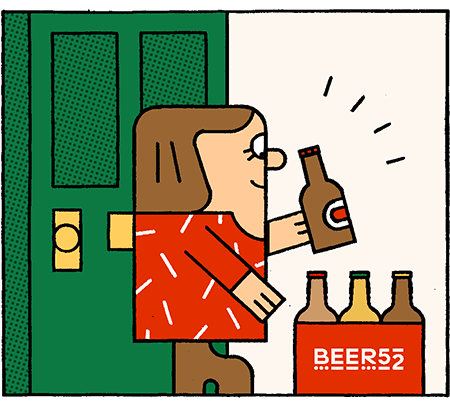 Complementing the bar’s already extensive range of craft beers – one of the most diverse in the city – we’re pouring several of the highlights for this month’s Beer52 box. The most popular on this sunny day are definitely Ilkley’s session IPA Alpha Beta and North Brewing Co’s Pinata. Joining us for the evening was a great crowd of our local members – some of whom have been with Beer52 since the start. For us, this chance to meet the people who made it all possible is what these events have been all about. As well as enjoying a few great beers together, we got the chance to learn more about the story of Drygate. Founded in partnership with Scottish craft brewers Williams Brothers, the Drygate brewery aims to “collaborate, curate and cultivate”. Offering up its studio kit for DIY projects, homebrewers who are making the first steps into commercial production or for one-off beers for bars and special events across the country. The Drygate team took two groups of Beer52 members on an extensive tour of the facility, answering questions on everything from the latest trends in craft beer to tips for Grainfather homebrew recipes. To those of you who came along – cheers! We look forward to having a beer together again; you were a great crowd. Tucked away within York’s historic city walls sits Brew York’s Craft Brewery Taproom and Beer Garden. Founded in 2015 by Wayne Smith and Lee Grabham, the taproom’s space is used incredibly well, creating a special atmosphere right through to the beer garden, which backs onto the beautiful River Foss. Lee explains of his taproom’s location: “We wanted to create a venue where people could reach us on foot and enjoy our beers as fresh as possible.” On the night, we welcomed a great group of Beer52 members from York and nearby, who not only got the chance to taste some of these ultra-fresh beers, but were also treated to the likes of Lotus, the New England IPA from Ilkley and the full line- up of beers from Redwillow. Our members were also given the opportunity to quiz Luke Raven of Ilkley brewery. Rob Brown, our head of operations, hosted the evening. The highlight of the evening was a tour of the brewery by its proud owners, who took time to share all of the ups and downs of their story and the values they follow to make their beers the best they can be. Brew York recently expanded, adding another 175 sqm for cold storage. Expect these guys to go all guns blazing with limited edition special one offs as well as some exciting barrel aged beers. Very special thanks goes to Lee and Wayne, Aidan and Andy for taking care of us. In the heart of Macclesfield, the RedWillow Bar strikes that difficult balance between trendy gastro taproom and old-fashioned pub perfectly, from the moment you walk in. Warm oak and copper set the tone, with beautiful parquet flooring and – most importantly – a great line-up of 15 taps and seven cask pumps. On the evening of our Beer52 tap takeover, the friendly, welcoming staff are ready in orange Beer52 t-shirts, brandishing copies of Ferment and cans of Perceptionless, Smokeless and Weightless for members. As our guests begin to arrive, the hubbub grows, the beer is flowing and people are enjoying the chance to sample beers on tap that will feature in the next Beer52 box, including Ilkley’s Lotus, Tiny Rebel’s Clwb Tropicana and Wild Beer’s Somerset Wild, alongside RedWillow’s own offerings. It’s also good to see several beers from the clutch of local breweries on the list, and we take the opportunity to sample a few that we’d not tried before. We join several members who have ordered food from the bar’s mouth-watering menu, going for a nduja, chorizo, cured ham, honey and rocket pizza, which is superb. As well as a great selection of pizzas, the bar also serves some good-looking mezze platters and a range of lunch-friendly small plates, alongside a fully stocked shelf of over 50 gins and other spirits. The entire menu has been developed by RedWillow’s own team of ardent gastronomes (see profile on page 28). It’s good to have a chat with the members, many of whom have travelled down from nearby Manchester by train. Phil Booth from Stockport has been a member since last summer. As the evening draws to a close, I resolve to come back for the RedWillow tap takeover in July, for which the brewery creates 10-15 special beers on its small kit for a full weekend of RedWillow beers on all the bar’s lines. This year the team is focusing on sours and yeast- centric beers. Can’t wait! Nestled in the centre of Cardiff in the shadow of the Millennium Stadium, Tiny Rebel Cardiff is a hubbub of activity on a Friday evening. Fifteen miles from the brewery site, the taproom-style pub is the perfect outlet for Tiny Rebel’s beers, enabling the brewery to showcase their regular beers and special one-off brews and collaborations in the heart of the Welsh capital. Naturally, then, Tiny Rebel Cardiff is the perfect urban location for Beer52’s roadtrip tap takeover, and on 5th May, around a dozen thirsty subscribers descended on the bar. Cans of the Clwb Tropicana, a juicy 5.5 per cent IPA, were kindly provided by the brewery for members on arrival, who were soon chatting away in the bar’s buzzing surroundings. Despite the cans being quickly snapped up by eager Beer52 members, some of whom had come from Bridgend especially for the event, nobody went thirsty thanks to the 20+ beers available on tap, including nine cask lines. In true craft beer pub fashion, the food offerings consist of build-your-own dirty burgers, served with American style slaw and fries, as well as pizzas and cheese boards. Although the brewers from Tiny Rebel were sadly unable to join our members due to their busy schedules (who’d have thought building a new brewery would be such a huge task? ), the chance to meet fellow subscribers and chat about some of their recent boxes was greatly appreciated by those who attended. “I always enjoy the chance to drink Tiny Rebel’s beers,” Beer52 subscriber Jack Irving told Ferment magazine, “and it was particularly nice to chat to other members about our shared passion for great beer. Whilst the brewery has since opened a second bar closer to their brewhouse in Newport, Tiny Rebel Cardiff remains their flagship site. The pub also regularly hosts board-game nights, pub quizzes and tap- takeovers from other breweries, and offers 10 per cent off on all bottled and canned beer to take-away. With closing time not until 2am every night, there’s no danger of being kicked out before you’ve had a chance to finish your pint.